How can language reveal insecurity? I just read an interesting Slate post by Katy Waldman on the linguistic nuances that can reveal insecurity. It was an enjoyable read, but also induced some eyebrow raising. The article is based on studies that use sentiment analysis, a natural language processing technique that aims to extract subjective information about a writer from a piece of text. Sentiment analysis is based on extensive correlations and machine learning. For example, an algorithm might be derived by analyzing hundreds of thousands of texts written by men and hundreds of thousands written by women in order to identify systematic differences between the two groups of texts. This approach reveals that elements of a text like use of specific pronouns can determine much about an author or a text as a whole. The study highlighted by the post pointed to linguistic overcompensation as an indicator of insecurity. One study (not yet published but discussed here) focused on insecurity at the level of an entire university. The rationale was that since it’s more prestigious to be a university (defined as an institution conferring at least one graduate degree) than a college, universities that are on the outer edge of the university group (i.e., ones that don’t offer Ph.Ds) might feel more insecure about their university standing. 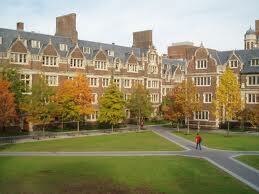 The researchers collected a sample of websites for top universities and top Master’s programs. The dependent variable was how often the institution mentioned its own name or used the word “university.” They found that Master’s universities were much more likely to emphasize the word “university” (using it in 60% of self-references) than Ph.D.-granting institutions (which used it in less than half of self-references). Next, they looked at a similar phenomenon in a different domain: airports. They assumed that those offering international flights were higher status than those only offering domestic ones, so they compared use of the word “international” in big airports and smaller airports (that are still international). They predicted that the smaller ones would feel more of a need to emphasize their international status and would consequently use the word more, and this is exactly what they found. Returning to academia, experiment 3 examined a similar effect in students at different universities. Specifically, they were interested in students at Harvard (a university that everyone knows very well is a part of the Ivy League) and students at Penn, often overlooked as an Ivy League institution. They asked the students to enumerate “things you think of” when you think about your school or describe it to people. They found that students at Penn were significantly more likely to use the phrase “Ivy League,” consistent with the previous two experiments. The idea that members on the border of a prestigious group emphasize their membership more is an interesting possibility, and I don’t doubt that it’s true in many cases. However, it doesn’t seem to be the only explanation for the findings. It seems extremely likely, for example, that small international airports emphasize that they service international flights because many people might actually be unsure, whereas LAX might not need to highlight this feature nearly as much. The same could be said for Master’s universities and students at Penn. The Slate author acknowledges this concern, but doesn’t do much to rule it out (I’m not convinced enough by her statement that “the researchers’ interpretation of their findings feels at least partially correct to me,” and her description of being an avid cheerer on her swim team because she was one of the worst swimmers). Projecting insecurity onto Master’s universities, small airports, and Penn students might not be a fair assumption. This type of research necessarily overlooks individual differences, which might be problematic for a topic as individualized as insecurity, and it will be cool to see more examples that either follow or refute this pattern.